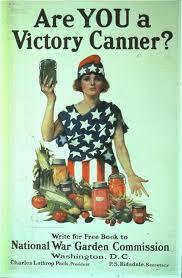 Propaganda poster encouraging those on the Homefront to can and preserve food. The girl’s role at Suffield school while in its military days certainly received the praise it deserved. During its time as a military school the girls of Suffield School took part in conservation, stamp campaigns, and even established the Liberty Chorus, an all-girls singing group that sang at multiple gatherings and events within the school and the rest of Connecticut. (https://www.nhregister.com/connecticut/article/West-Haven-Historical-Society-hosts-open-house-11317021.php). The Liberty Chorus sang motivational, pro war songs, in hope that they would boost morale at the school and further motivate the boys at Suffield School to go over-seas and fight. They were the cheerleaders of Suffield School during WWI. In terms of Liberty Stamps, the campaign was a fundraiser that included selling stamps to fund school updates. Back in the early 1900s people wrote letters to one another, so the stamp was quite relevant and in high demand. The stamp campaign helped raise more than $4,800 in only five days. That is equal to approximately $57,920 if the campaign were to be run today. The conservation methods run by the girls of Suffield school were formidable to say the least. Canning two and a half tons of tomatoes and one thousand six hundred quarts of corn was critical to the rationing effort, and the support from the school farm was certainly important. Some of the boys worked on the farm in the summer to help pay for school, and the farm’s five hundred chickens, thirty pigs, and eight cows was more than enough to feed the 140 students on campus at the time. This entry was posted in Capstone, History of our Local Environmental, Intersection of History and Landscape, School Farm, WWI on March 1, 2018 by dylanchase62400.